Diana and Parag’s wedding took place at The Blue Hill at Stone Barns and they wanted a very sleek and modern wedding invitation. The barn wedding invitations were a custom printed box with a foil pattern and held a compartment for a handmade nest with a hollowed out blue chicken egg. A small accordion note was pinned to the nest with directions to “crack open” the egg and had a short history of the farm at Stone Barns. Inside each egg was a hand written personal not to each guest. The barn wedding invitation was printed with embossed foil and the inserts were held in a separate compartment. 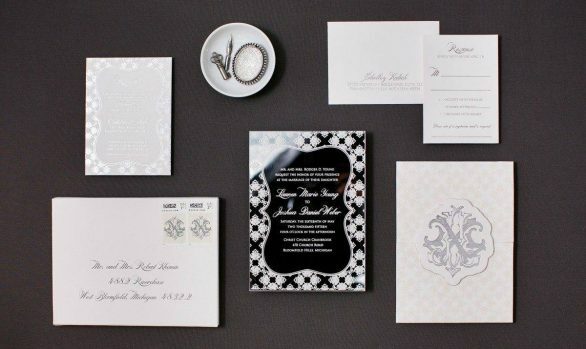 Each custom printed invitation box was shipped to the guests in a silver mailing package.